← Best bargain on the ballot! Here we go again. It is unfortunate that yet another Alameda mayor has been elected without majority support. Marilyn Ezzy Ashcraft won the seat with only 41.97 percent of the vote. Blame it on Alameda’s use of a plurality voting system, which does not require that the victor receive at least 50 percent of the votes cast. The question is whether Alameda has some true progressives who will initiate changing Alameda’s electoral system from plurality to ranked-choice voting. 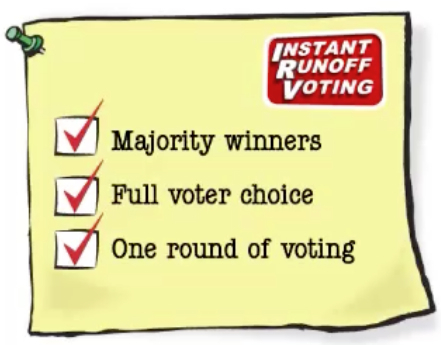 Ranked-choice voting, also known as instant runoff voting, ensures the winner has at least 50 percent of the vote. Instead of voting for one candidate, voters get to rank their top choices in order of preference. On Election Day, if no candidate receives a clear 50 percent majority of first-choice votes, voters’ other choices are tallied. The lowest vote getter’s second choice votes are electronically transferred up the line until one candidate reaches a majority. Our mayor-elect may still have prevailed under the ranked-choice system, but without that system, we are left knowing that she was not the first choice of over 58 percent of the voters. It’s not good for her or the voters. When there is more than one at-large seat to fill, as in Alameda’s city council elections, the threshold and counting method for winning is adjusted. Ranked-choice voting ensures fair representation, fair elections, and fair access. It’s easy to use, encourages voter participation, and has been tested. Why not here in Alameda? Ranked-choice voting is used in other Bay Area city elections. San Francisco, Oakland, Berkeley, and San Leandro have been using ranked-choice voting for years and have grown to embrace it. The system has eliminated costly runoff elections and improved civility. Oakland Mayor Libby Schaaf, who won re-election by a decisive margin, has repeatedly expressed support for ranked-choice voting. She reportedly said, “As a candidate, you have to talk to everybody, even people who you know you’re not their first choice. But you can still be their second choice or third. It changes the way you run campaigns.” Schaaf’s broad outreach was successful enough that second and third choices were not necessary to clinch a second term. 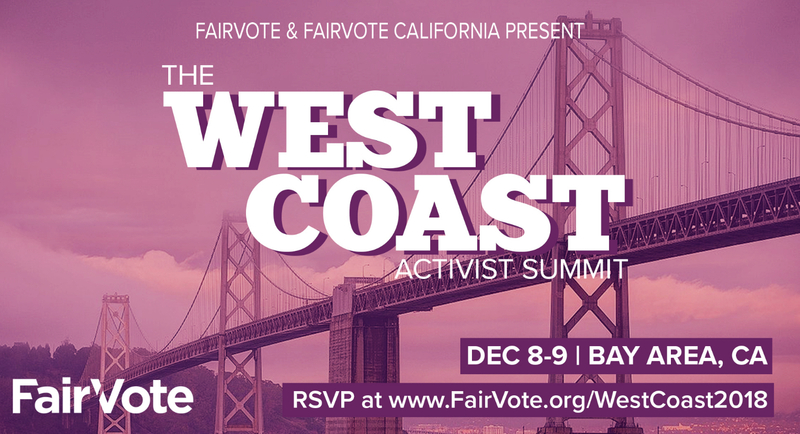 FairVote, the leading advocacy group for ranked-choice voting, will co-host a region-wide two-day summit on December 8-9 in Oakland with panels, lectures, and strategy sessions to grow the ranked choice voting movement on the West Coast. If you’ve been wanting to get involved in being an activist for ranked choice voting but weren’t sure how, this is the event for you. For details, see Fairvote.org/WestCoast2018. Alameda could institute electoral reform for the mayor’s race first and consider the council races later, after everyone is familiar with using the system. Our elected city leaders should begin their terms with the mandate a majority vote provides. This entry was posted in Elections and tagged Alameda, FairVote, instant runoff, Libby Schaaf, Marilyn Ashcraft, progressives, Ranked Choice Voting. Bookmark the permalink. 6 Responses to Will the real progressives please stand up? Irene, I appreciate your zeal for ranked-choice voting, which does have advantages. I believe it is more important for us to reform our local campaign financing laws — at least to ensure full disclosure of who has paid for each and every campaign ad, flyer, radio, and TV ad — than to set up ranked-choice voting right now. This may need to get done in state legislation rayther than by local ordinance, but campaign financing and dirty money in politics are a major issue, as we have seen in several recent elections…. Even when we know who paid for what, the current plurality voting system is still not fair representation. I wrote this in a previous post: With plurality voting, voters and organizations often support a candidate they’ve been told is likely to win, even when their true preference is for another candidate. Partisan funded polls, even phony ones, take advantage of this system. There’s an insidious common wisdom that voters shouldn’t “waste” their vote on a candidate who “can’t win.” Lopsided expenditures by a machine candidate and phony slate mailers add to the perception of invincibility. Somehow I believe if your candidate had won, we wouldn’t be having this conversation. Mayor Spencer won with a vey small lead of 120 votes, and Mayor Gilmore conceded and moved on. I have been writing about this subject for decades–after and before elections. My intention is to draw attention to changing Alameda’s archaic voting system. For those who are interested in modernizing it, the FairVote event is a great opportunity to learn how to do it. Thanks for posting about Ranked Choice voting. It makes a lot of sense to me. It looks like it makes it so candidates will make efforts to appeal to a wider spectrum of voters. This would be great for state and national elections as well. I’m pretty certain we’d have a different president at this time if we had this in our last presidential election. A friend of mine who successfully ran for Oakland city council against a large number of opponents said that ranked choice voting made the campaign more civil since her fellow candidates were vying for #2s and #3s. Civility works for me.